It appears that the story about U.S. suspicions about Russia's violating the INF treaty has just received a new life - a report published last week by Josh Rogin, suggests that the administration officials "told lawmakers that Russia had violated [the INF Treaty]" at a closed hearing held on 27 November 2012. The sources of this information are still anonymous, but the language is somewhat stronger than one in the earlier report by Bill Gertz, who quoted an unnamed intelligence official suggesting that the Rubezh missile tested by Russia in June 2013 "would violate the INF treaty" if its true characteristics were known. I don't have much to add to what I wrote earlier - it is clear that the missile has been tested over intercontinental range and indeed it has been declared as an ICBM for the purposes of the New START treaty. Most of the evidence seems to suggest that Rubezh is a "medium-class" ICBM, but there is a theoretical possibility that it is indeed a shorter-range missile. Yes, it was flown from Plesetsk to Kura - about 5800 km - but we don't know if the missile was tested with its nominal payload. Unlike its predecessor, New START does not require telemetry exchange, so we don't really know what the payload was. One good argument against the "Rubezh is an intermediate-range missile" theory is that it would be rather stupid of Russia to build an IRBM and declare it as an ICBM for the New START purposes. But, unfortunately, it's not entirely impossible. Whether or not this is indeed what's happened, normally these kind of disputes would be quietly resolved in the Bilateral Consultative Commission. But it appears that the issue already entered U.S. political fray, so we will probably hear more about it, mostly from Congress. This is not the first treaty compliance dispute, of course. For example, in the 1990s, Russia believed that the United States maintain the capability to deploy more than eight warheads on Trident II D-5 missiles. 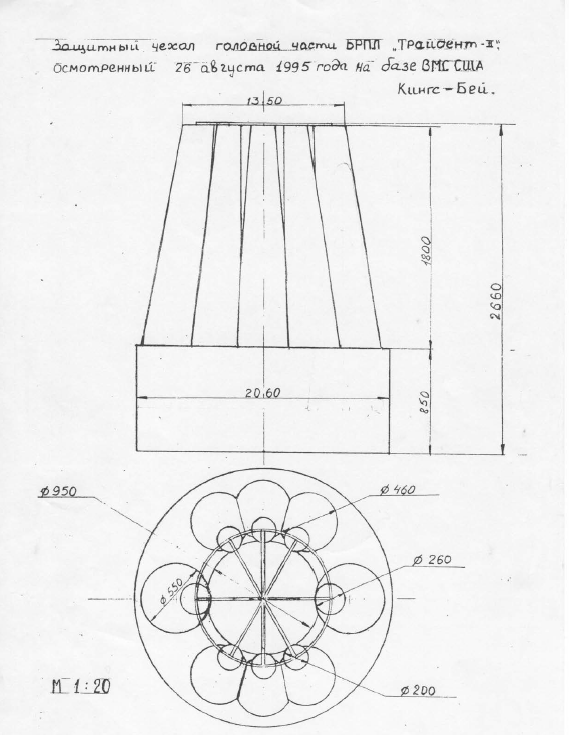 The verification mechanism of the START treaty provided a way to check the number of warheads deployed on a missile, but Russia was unhappy about the hard shroud that the Navy used to cover the warheads and insisted that the shroud could hide more than eight RVs. 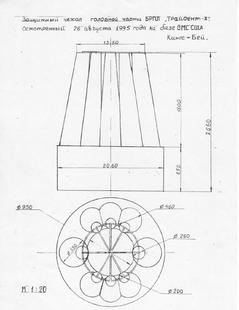 The drawing on the left shows how the shroud looked like during an inspection at Kings Bay on 26 August 1995. 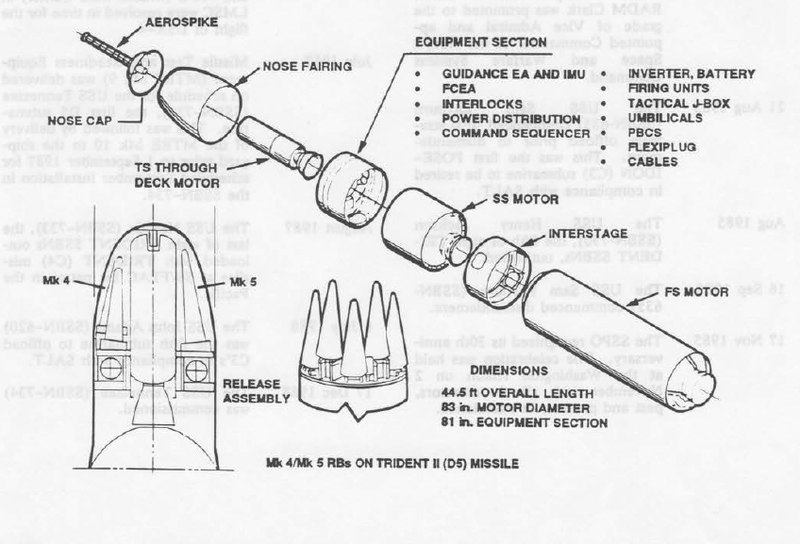 It suggests that the missile carries eight warheads - six Mk 4 and two Mk 5 (below is an image from "A History of the FBM System", p. E-16, that shows possible warhead arrangements). The idea was that one could hide two Mk 4 warheads under the big Mk 5 shroud bump. Of course, in many ways it was more a matter of principle, rather than a real concern, but there were other signs that suggested that the United States may have a way of circumventing the treaty obligations. For example, in the October 1997 tests (apparently the two D-5 launches from HMS Vigilant on October 1997), Russia saw the missile bus performing 16 maneuvers, of which 12 were warhead deployment maneuvers. The telemetry showed 11 warhead separation commands. Also, the total weight of deployed payload was determined to be 1710 kg and 1620 kg and warhead mass - 99 kg and 88 kg (close enough to the 91.7 kg weight of W76). The United Kingdom, of course, was under no obligation to limit anything, but it was clear that the test data would be shared with the United States. Russia, of course, communicated its concerns to the United States in the Joint Compliance and Implementation Commission, but never went public with them. As far as I remember, Russia considered making a moderately strong step of officially declaring that its inspections cannot confirm that Trident carries no more than eight warheads, but it's never been done. I doubt the U.S. Congress will be able to show similar restraint, though. If there is a moral in this story it is that the lack of transparency hurts much more than it helps. In New START Russia insisted (and the United States didn't mind) that the treaty data will be classified. Now Russia will have to deal with the consequences of what decision - if the data were open the controversy would not have appeared in the first place. I think the Rubezh missile in general and the June 2013 test in particular has confused the United States. Is this a missile that with a single warhead is an ICBM? 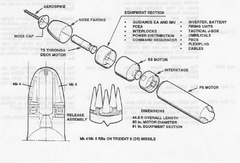 Is this a missile, when armed with three warheads, lacks ICBM range and therefore is “something else”? On one hand, if Russia wants to declare & count the Rubezh missile under New START, the US has few objections. On the other hand, why would Russia do that? Moscow is being unusually coy about all this. I think that coyness has created distrust that is being exploited by the “Kremlin Watchers”. It’s just American politics. Why is this "coyness", as you call it, unusual? When has Russia previously been forthright and open with the general public about development of its strategic systems? Russia owes the United States a private government-level declaration and a demonstration of this system to the satisfaction of the observing party when testing is finished. That's pretty much it. Bill Gertz can spin the Yellow/Red peril ad nauseum, it doesn't create any extra obligation for Russia to spill state secrets, right? You miss the point. It was a “government official” from the Obama Administration that briefed Congress not Bill Gertz. That is what’s stirring the pot. I disagree. I think the Kremlin has always been very forthcoming with the Pentagon on military-to-military technicals. I think its been those “back channel” communications that has created trust and made treaties such as New START possible. In regards to Rubezh, the silence has been deafening. Bill Gertz is the one making a public show for politics. Rose Gottemoeller or John Kerry complaining in a closed committee hearing is just low-level bitching that US and Russia do all the time. US has always been complaining about Russian treaty adherence. Anyone remember "hydronuclear testing" brouhaha (http://lewis.armscontrolwonk.com/archive/6011/subcritical-experiments)? That and any other low-level complaints are just hot air. It's not like US officials accused Russia of testing nuclear weapons, it was just a minor complaint for the record. The ones raising it to the level of DANGER DANGER VIOLATION IMMINENT DEFCON 5 are Bill Gertz and their ilk, who are spinning it into some political game against Obama's administration. Yet, if the US official; be it Rose Gottemoeller, John Kerry or one of their minions, simply stated “hey, we’ve looked at this and there’s no INF violation”, Bill Gertz wouldn’t have a story, would he? Look, there is nothing going on with Rubezh that is particularly new or out of order as the facts of the ground tell us. The Russian government does not want to disclose too much information about their new weapon system. Sounds like business as usual to me. Sounds exactly identical to American S.O.P. I read a lot of things on this subject in the American press, but didn't understand: in WHAT the U.S. OFFICIAL claims SPECIFICALLY consist? It seems little Russia does these days gets “DEFCON attention” in the United States. I wish we knew what is the nature of the problem. By the way, I find it very hard to believe that administration officials actually "told lawmakers that Russia had violated [the INF Treaty]". I'm sure the language was different.